When Julia was two years old she was permitted to go with her grandmother, Anne Christensen Hansen, to visit for a period of two weeks or more. Anne Hansen lived some five miles from the Petersen family. Julia was brought back home by Anne when her work permitted. She worked at the Master’s house when extra help was needed. This chore kept her busy most of the time. The Petersen children were riding a short distance with Anne as she was on her way home after bringing Julia back. The other children got out of the cart, but Julia cried. Julia wanted to go home with Anne again. From then until she came to America Julia lived with her grandmother. Julia slept in the arms of Anne Hansen. Anne Hansen went to the city daily delivering sawdust to the butcher shops, moss to the green houses and small evergreens to be used when there were funerals. It was the custom to place evergreens on each side of the door where a death occurred. Also needles and small twigs were scattered in the path of the mourners. Anne made Julia a sheepskin coat as the weather was often very cold and Julia would be in the cart many hours at a time. Julia brought this coat with her to America. Anne’s house, which is still standing, was a beautiful memory to Julia. The house was surrounded by currant bushes, flowers and a neat fence. Flat rocks were used for paths in the yard. The house faced east off the shores of a small lake. The schools in this vicinity were secular schools. Anne having joined the L.D.S. church could not send Julia to be taught in these schools. Hence Julia’s chance for an education was meager. Many valuable lessons in character building were learned from Anne. Julia owed much to this dear woman for her training. Julia had a good musical education and learned many songs. She entertained the neighbor’s children with hymns and afterwards sang to her own grandchildren. Julia left Norway at te age of eleven with her older sister Serena and brother-in-law, David Jensen for America on April 6, 1863. David later became Julia’s husband. The trip to Utah was long and rough. Julia walked every step of the way from Florence, Nebraska to Salt Lake. She and other children gathered buffalo chips and helped with the work about the camp. They went at once to Lehi upon their arrival in Utah. They stayed in Lehi three years. Julia went to work for a woman by the name of Jacobs who was very particular about her house-keeping. Julia, being anxious to please and nervous about what was to be done about the house got up several times in her sleep and washed every dish in the house. Julia’s health became impaired; her teeth turned black, so Serena took her home. While living in Lehi, Julia and her friend Margaret Olsen, later Margaret Clayton, had an experience with an Indian which might have proven tragic. They were out form the settlement gleaning the fields when an Indian appeared. The Indian made threatening advances towards the girls. The girls said that their father was cutting brush near by in the willows. They started in the direction of the willows with their hearts in their mouths as they knew no one was near. The bluff worked and they reached home safely. Margaret Olsen Clayton and Julia were dear friends, companions, and neighbors. They raised their children together and associated on most intimate terms until Margaret’s death. David, Serena, and Julia moved to Franklin, Idaho in 1866 or 1867. Julia became David’s second wife after moving there. To this union were born 12 children, seven boys and five girls. Among the girls were a pair of twins. Samuel the oldest child was born in Franklin and the rest were born in the Worm Creek homestead. Seven of the children preceded Julia in death, three as babies, one three years, one five and one six. Two of them died of diptheria in one week. Peter died when he was 24 from Typhoid fever. In 1872 the Worm Creek flat and surrounding country may be described in the following few lines. Imagine a vast stretch of rolling hills and flat land. The whole area was covered with sagebrush, rabbitbrush, bluegrass, and no fences. The pasture for the animals extended from the hills on the east to Bear River on the west, from Franklin on the south to Riverdale on the north. Mexican long horned cattle roamed hither and thither. The settlers houses were miles apart and the nearest settlement was Franklin. The land was there in the rough as nature had made it. It was up to the settlers to wrest a living for themselves and families from this same land. This is a picture of the beginning of Julia’s life in Preston. Julia’s home was built on the brim of the hill near Worm Creek at the north end of their quarter section. The house stood until a few years ago. The house was made of logs with a dirt roof, and for a number of years had a dirt floor. The beds were the usual corded bedsteads with the straw ticks. This was the spot that meant home to Julia and her family for a number of years. Julia used to whitewash the house with white clay (at one time making a trip to Soda Springs after the clay). She kept a bouquet of wild flowers to adorn the house. It was not uncommon for members of the family to walk to Franklin and back, sometimes barefooted. At one time, Samuel, while a little lad, was driving a span of small mares (Kate and Doll), the first team of horses David owned, from Franklin. Julia walked and drove the sheep which were being brought to the ranch. The team ran away with Samuel and fortunately he was not hurt. Charles Spongberg settled on the quarter section west of the Jensen’s about the same time. On Spongberg’s place was a spring and when a cool drink of water was needed someone had to make a trip to the spring. A large brass bucket was used to carry water from the spring. It was a long jaunt to the spring across the quarter section. The rest of the water came from Worm Creek which was about 60 rods away from the house. Later a well was dug at the house. During the summer the washing was done by the creek. A large copper tub over a bonfire heated the water and boiled the clothes. Often the dinner was taken to the washer so that Julia might not have to lose time going and coming from the house at meal time. The washing could not be done in the cool of the day with so many outside chores to do night and morning. Life to the pioneer woman was very strenuous, and Julia spent much of her time helping with the farm work. The farm work was done largely at this time by hand. It took many hands to get the work done. Julia cared for her family and house at night, after the outside work was done. In the spring before Peter was born in July, Julia sheared all the sheep. That fall when the wheat was ripe, she cradled and bound it. Julia had a knack of binding wheat. When David cradled wheat, she could do her share of binding it. There was also the matter of gleaning wheat heads left in the field, for it all had to be saved. She helped with the hay which was cut with a scythe. Julia lowed for many years with a hand plow and oxen. She drove away the crickets, helped destroy the grasshoppers (which wrought such havoc with the crops) and did all kinds of farm work. It was not uncommon for the Jensens to milk 15 cows and the milk had to be taken care of on the farm. Julia made cheese, sometimes in a large kettle outside. Many nights she stayed up all night to stir and properly care for the cheese. Julia churned butter and put it in large barrels of salt brine. This is the way the butter was kept during the summer months. The butter had to have the salt worked out with fresh water before it could be taken to Salt Lake and Ogden to sell. Later the butter could be sold in Preston. Julia would pack the pounds of butter in a wooden bucket. Christina many times walked the three miles to the Chapman’s store often to get there before the storekeeper. Christina would leave home before sun up. The butter sold for eight to ten cents per pound in script. The Chapman store was just a little south and east of the egg plant or just a little east of Clyde Rallison’s home. Julia sheared sheep, washed, carded, spun and dyed the wool. Rabbit brush, indigo, nadder, etc. was used for coloring. Julia had a candle mold which would make six candles at a time. This was part of the regular work, to prepare the light for the house. Julia made the soap for household use. The soap was made from animal fat and lye from wood ashes. Julia spent evenings at home carding, spinning, knitting or churning. She got a chance to do some reading while churning. They subscribed for a newspaper and the Women’s Exponant. She read a great deal. She was a logical thinker, and had an analytical mind. Julia did her family’s sewing. She stayed up all night to make Junius a suit so that he might go to Charlie Petersen’s wedding. Junius’ suit was made out of his brother Peter’s suit. Peter’s suit was taken to pieces and turned. It was blue. Julia made the first suit Junius earned. Junius had a picture of himself in this suit. The cloth which the suit was made from was bought in Franklin. Julia’s sewing machine cost $21.00 and John Martin got it for her from Montgomery Ward Company. Julia made some dried peach pies for Christmas. Each child got one half a pie. This Christmas stands out in Junius’ mind as one of his finest Christmases. The Sunday School Jubilee was one of the earliest social events of that time. They also went to Logan to Conference. Julia attended the dedication of the Logan and Salt Lake Temples. Julia was below the average child in size until she was about twelve. She grew large and rapidly when her growth started. Julia was a large woman. She was 5'8". She had a large frame, and weighed 180 pounds – she was not fat. Julia had black hair and blue eyes. She suffered from neuralgia which was probably caused from her teeth. She had pain start about ten at night and keep her up until morning. This would go on night after night. Julia had an exceptionally good heart and stomach. Her eyes were good and she had a good memory. In later years, her feet gave her a great deal of trouble. In 1912 she tipped over on a load of hay and broke her arm. Julia was present at the meeting when the Preston Ward was organized. She saw it grow from one ward to six wards. 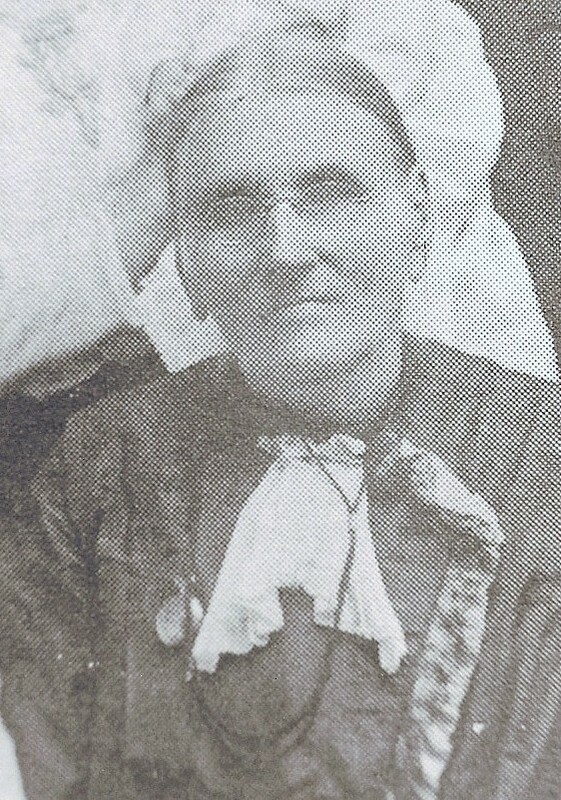 Jennie Wilcox was the first president of the Primary Association in Preston. Julia was Jennie’s first counselor in the Primary. The Primary was organized in 1879 and Julia had charge of the east side of Preston. Julia walked to the meeting house which was one and a half miles away. 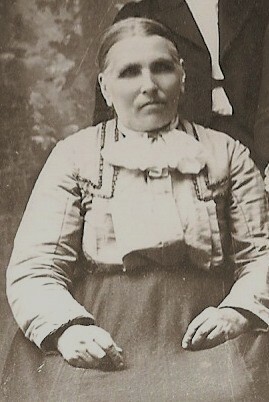 Julia joined the Relief Society in Franklin in 1871. She was chosen a visiting teacher at that time and acted in the teacher capacity until 1902. Relief Society meetings and quiltings were had at times at the Jensen home when Rachel Porter was President. 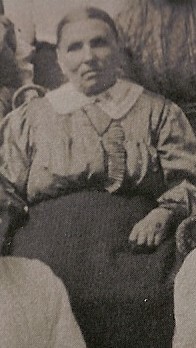 Nellie Porter Head, as a child, was taken to the Jensen’s by her mother to visit. Christina and the others had to carry Nellie in the stubble because she could not run in the stubble barefooted. February 9, 1902, Preston was divided into wards. Julia was chosen as first counselor to Elizabeth Daines who was President of the Second Ward Relief Society. This office Julia held until April 21, 1914 when she was put in president of the organization. Julia was released from this job June 17, 1917. Julia considered it an honor and privilege to work in the church. The church meant so much to Julia and she gave her best effort, time, strength and faith in the service of her Master. Julia left an enviable record for her children to follow. Julia believed in being a doer and not just a listener. Julia was a strong character and an outstanding figure among the women she came in contact with. Julia saw every house built, fence made, trees planted, ditches dug, streets laid out, businesses started, enterprise progress, and school grow in the Preston area. Julia watched the railroad come in, the pavement laid, and the electric lights turned on in Preston. She saw the struggles, the energy expanded, the failures, the successes, the heartaches and the joy of the settlers. Julia took part in it and was instrumental in helping to make Preston a fine community of common wealth. Julia’s relation with David was strained to the point of separation, yet they had few differences. It is said they only had three disputes in their lives. She always spoke of David’s qualities. Julia taught her children to honor and respect their father. One time in her presence, Wilford called David “dad”. Wilford was given to understand that he must respect his father by always calling him “father”. Julia was willing to leave the matter of family relationship to be settled on the other side. Julia moved from the homestead on Worm Creek in 1896. She made her home in the south west part of the city in what is now the Sixth Ward. This place is on 4th West and 7th South. The remainder of Julia’s life was spent at this place, and in Rexburg. She had children living in those places. She visited from place to place during her last years. Julia was a companion, friend, counselor, guide and strength to her children, and they called her blessed. 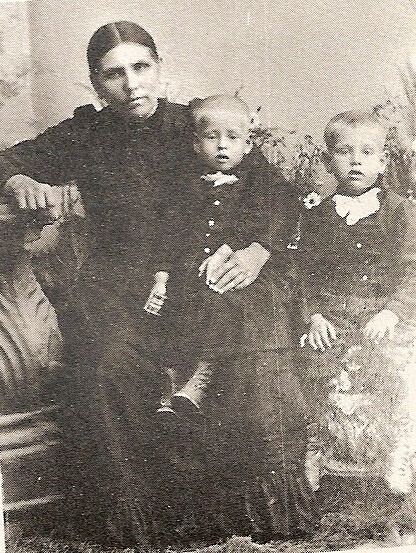 Julia was visiting with her sons, Wilford and Elmer, when she contracted pneumonia. She left this life March 11, 1920 at Burton, Idaho, in her 69th year. She is buried in the cemetery in Preston. She died as she had lived with full faith in her Creator, that all is well and His will be done. At the time of her death, she had a posterity of five children, and 25 grandchildren and five great grandchildren. Elmer Jensen, Julia’s youngest son states: “Mother was with us up to Burton (near Rexburg, Idaho). My brother, Wilford and his family and my family lived in the same house only in different rooms. Mother took very ill. She thought she got her cold going to Relief Society, in a white topped buggy. It was very cold and chilly. She took ill and was sick for about a week and we sent for Christina, her daughter, June and Sam, her sons. They all came. One morning she told us, “My son, Peter, has been here and he said he’d come back at a certain time tonight to get me. Now if there’s any questions you want to ask me, now is the time to do it because he’s coming for me at that time.” We thought of things that we wanted to ask her. She answered the questions we asked her and at the time appointed, she was gone.